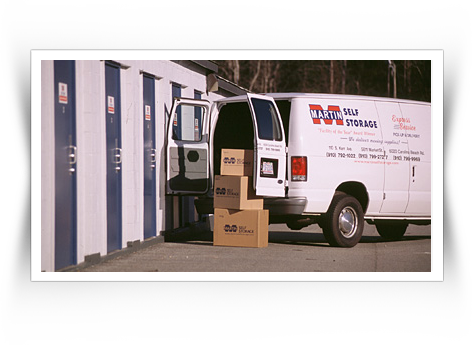 Why Martin Self Storage Centers? It is our goal to make sure storing your belongings is easy and convenient. 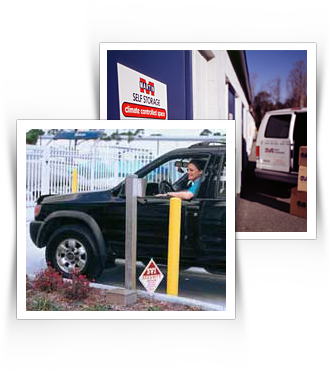 Our self storage centers are clean, safe, well-lit, monitored 24 hours a day and accessible 7 days a week. We offer a full line of unit sizes to choose from and each unit is easy to get to. We make your storage experience trouble free...why settle for less? Heated and cooled units ~ For an extra level of protection for temperature sensitive valuables such as antiques, furniture, documents, pianos, and electronic equipment. Our climate controlled units limit exposure to extreme temperatures and high humidity. Computer controlled access ~ Our computer controlled access lets you visit your unit 7 days a week including holidays. Monitoring of activity ~ Activity is monitored and recorded 24 hours a day with state of the art security systems such as video surveillance. Each gate entry is recorded and stored. Only tenants can access our electronic gates. Boxes and packing supplies ~ Each self storage center offers a wide range of packing and moving supplies including different size boxes, tape, and paper. You can pack everything from books, dishes and seasonal wardrobes or cover your bedding and furnishings. Quality construction ~ All buildings are made of proven quality components which includes a standing seam pitch roof with fastners attached from beneath. Heavy plastic sheathing under the concrete floors provides a moisture resistant barrier. Storage center office and supply showroom ~ It is no secret that the busiest moving days are the weekends. That's why we are open Monday through Sunday, 7 days a week to better serve you. On site resident manager at most locations. Click Here for a complete list of supplies. Tenant trucks ~ Many of our sites have tenant trucks to assist your move. All trucks are 15' and carry up to 4 rooms of furniture. Hand trucks and furniture pads are also offered. Trucks and accessories are available for general rental. Moving van turning room ~ Our facilities are designed for eighteen wheel trucks and moving vans. This makes life easier for those first time rental truck drivers. Outside storage ~ Most of our locations have space for boats, cars, RV's and campers. Business deliveries accepted ~ As a service to our commercial customers all deliveries will be signed for and placed in your unit. Storage is the last thing business clients have time to worry about. we offer a program for working with business clients. Whether you are a contractor, distributor, salesperson, retailer, or entrepreneur, self storage provides a great alternative to occupying costly office space or taking up space at home. All deliveries for businesses will be accepted and placed in their unit at no extra cost. Each unit is accesible for tractor trailer deliveries.